Avenida Del Palmeral, S/N, 04720 Aguadulce - roquetas de mar, Spanien. 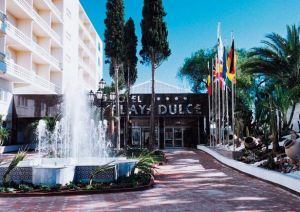 Playadulce hotel is located in Aguadulce between Almeria and Roquetas in front of the beach and the promenade and just a few km away from the Port and 5 minutes from the Congress centre. Golf lovers have 3 golf courses close by: Golf La Envia, Golf Playa Serena and Golf Almerimar. Furthermore for those who need to organize a meeting or a celebration, the hotel Convention centre offers different meeting rooms with different capacities and a great service.